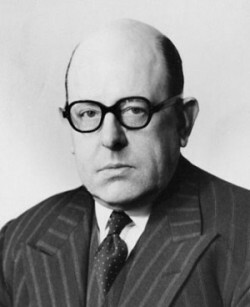 DES was created as first synthetic estrogen by Sir E. Charles Dodds, and his team in England. The chemical formula is actually rather simple. DES was not patented because Dr. Dodd’s discovery was funded by the British government with a policy that inventions from government-sponsored research be available to all. This allowed pharmaceutical companies access to a drug that was cheap and easy to produce. DES was developed for short-term use for menopause symptoms. It was not developed to give to pregnant women, which wasn’t done for several more years. French medical journal reported that DES caused mammary tumors in male mice. DES was formally granted FDA approval for use as a miscarriage preventative. Harvard University husband and wife physician and biochemist George Smith, M.D., and Olive Smith, P.h.D., published studies in the next few years extolling use of DES in high doses to prevent miscarriage. Drug company representatives used this published study for convincing doctors to prescribed DES to pregnant women. DES proven ineffective when William J. Dieckmann, M.D., of University of Chicago’s Lying-In Hospital, conducted the first controlled, randomized, double-blind study on use of DES during pregnancy. Published in the American Journal of Obstetrics & Gynecology 1953; 66:1062-1081, the research reveals DES did not work to prevent miscarriage. Even so, DES continued to be prescribed to pregnant women until 1971, in large part because pharmaceutical companies discredited the study and heavily promoted DES to doctors. Years later another review of Dieckmann’s data showed that women given DES actually suffered a higher rate of miscarriage than women not prescribed DES! Studies take place at Iowa State College and Purdue University into fattening cattle by putting DES into their feed. The FDA granted approval on 11/1/1954 with the only protection for consumers being the stipulation that DES use had to stop 48 hours before slaughter. U.S. Food and Drug Administration banned DES as a growth stimulant for chickens after high DES levels in poultry produced side effects, such as male breast growth in humans. The government cannot be accused of moving swiftly. 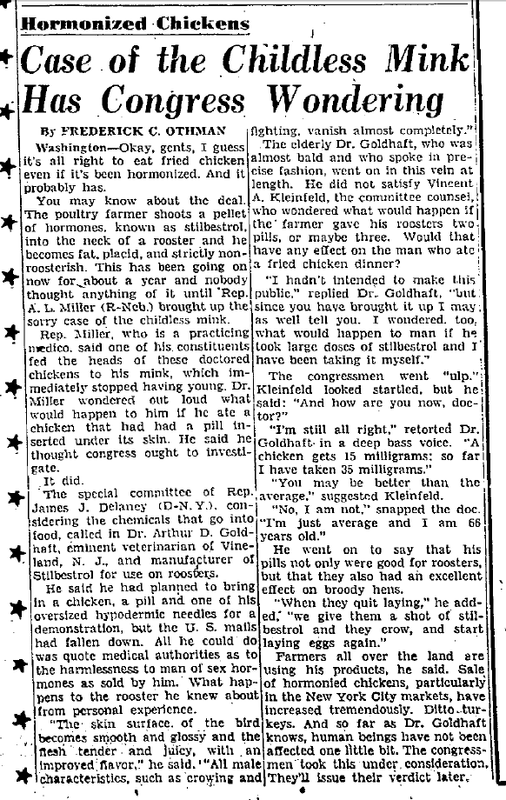 This article by syndicated newspaper columnist Frederick Othman appeared in the Chester, PA Times on 12-11-1950 depicting some of the concerns of the day – starting with childless mink. But it took until 1959 for the DES ban to be announced. Even then, it didn’t take effect until 1966. Poultry producers fought the ban until finally in 1966 it was upheld in court. It was years later until DES was banned for use in cattle. The research study that changed everything was published on April 22, 1971 in the New England Journal of Medicine. 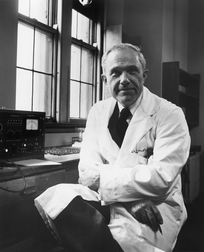 Arthur Herbst et al, linked prenatal DES exposure to a rare vaginal cancer in girls and young women – clear cell adenocarcinoma (CCA). During the late 1960s and early 1970s, this rare cancer had been diagnosed in a cluster of young women when normally it occured only post menopause. Their doctors sought answers until one mother asked whether the DES she was prescribed while pregnant caused her daughter’s cancer – and the connection was made. On the basis of this study the FDA issued a Drug Bulletin to physicians, stating that DES is contra-indicated for use in pregnant women. The FDA did not ban DES, but only urged doctors to stop prescribing it for their pregnant patients. Most, but not all, stopped, meaning sadly, DES was prescribed to pregnant women in America into the early 1980s, and later internationally. Researchers studied the effects of DES on DES Daughters and found significant abnormalities in the reproductive organs of these women, which often resulted in infertility or serious problems in pregnancy. 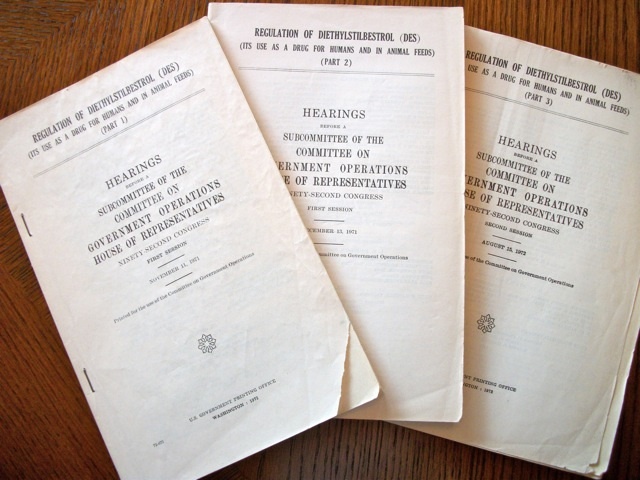 Three hearings were held on Capitol Hill by the House of Representatives Subcommittee of the Committee on Government Operations to consider “Regulation of Diethylstilbestrol: It’s Use As A Drug For Humans And In Animal Feeds. First consumer information regarding harms caused by DES exposure was published by independent grassroots groups in Berkeley, CA and Cambridge, MA. Berkeley, CA group joins forces with the Coalition for the Medical Rights of Women, in San Francisco. Three DES Daughters and one DES Mother were appointed to the CA Department of Health Ad Hoc Advisory Committee on DES as consumer activists started having their voices heard. California Health Department held health care provider workshops in San Francisco and Los Angeles. DES leaflets were sent to every physician in CA. First meeting of DES grassroots groups from CA, CT, IL, MA, NJ, NY, PA and Wash, DC took place. It was decided, at that time, to unite as a national organization under the name of DES Action. DES Action USA was founded and incorporated, as the national non-profit consumer group for individuals exposed to DES. Brochures, posters (some featuring Co-founder Pat Cody, her husband Fred and daughter Martha), and flyers all helped spread awareness DES. DES Action was included in the design and carrying out of a California statewide pilot project of DES public information.In February 1978, U.S. Secretary of the Department of Health, Education & Welfare, Joseph Califano, convened the National DES Task Force. It was charged with reviewing all aspects of the DES problem and with making recommendations for research and health care of the exposed. The National DES Task Force issued a physician advisory in November 1978 recommending doctors review their records and notify patients who were prescribed DES. Some, but not many physicians complied. First successful legal trial took place over DES injuries. Joyce Bichler, 25-year old cancer survivor, was awarded half a million dollars in her case against Eli Lilly. The gripping story of how she beat cancer and fought back in court against drug maker Eli Lilly is told in her book, DES Daughter: A True Story of Tragedy and Triumph. DES Action in San Francisco received a grant from MS Foundation to hire a program director. DES Action affiliate group in Washington DC received a grant from the Eugene and Agnes Meyer Foundation to fund a public and physician DES education program. U.S. Agriculture Dept. banned DES use in cattle feed. It took effect a year later, in 1980. CA legislature funded a DES public and physician education program. DES Action in San Francisco selected to create the public education materials and hold workshops. As part of this state contract, DES Action published a 56-page manual, “Community Organizing for Health,” along with a 15-minute slide/tape show developed to educate health care providers about DES. CBS-TV’s “Lou Grant Show” featured a DES storyline that presented the DES issue to a national audience. The show, called “Inheritance” is available to watch free, on Hulu. First national meeting of 19 DES Action affiliates from around the country was held in San Francisco. As of this year, DES Action members in at least eight states (CA, FL, IL, ME, MD, MA, MN, NY) had successfully advocated for legislation prohibiting insurance discrimination against those exposed to DES. Legislation additionally included, in several of those states, the creation of education programs and DES screening centers. DES Action secured grant support from the L.J. & Mary C. Skaggs Foundation of California, as well as the first of several annual grants from the J. Aron Foundation of NY. The DES Cancer Network was formed. First national DES Awareness Week held in April in 29 states. Launch of two-year project of DES Action/San Francisco to demonstrate consumer-physician cooperation for improving care, and providing support and information for DES Daughters. DES Action publishes “Working Together: A Manual for Consumer Groups Working with Medical Professionals. DES Action efforts resulted in President Reagan’s Proclamation of a national DES Awareness Week held April 21-27, 1985. DES Action sponsored the first international gathering of DES researchers; the meeting was held in Berkeley. DES Action sent a representative to the UN Decade for Women Conference in Kenya where she gave workshops and distributed DES pamphlets in Arabic, Swahili, Dutch, Spanish, French and English. Results from the first DES Action Health History Survey, conducted in 1984, are finalized and released – showing higher ocurrences of arthritis, asthma and Lupus than in the general population. This anecdotal survey helped guide NIH researchers to further investigate these areas of concern. (Note: researchers have not been able to officially link these issues to DES exposure but studies continue). First international DES meeting held in Toronto, Canada. Following a six-year effort by DES Action and the DES Cancer Network, New York State changed its Product Liability laws regarding statute of limitations for filing lawsuits – allowing more DES Daughters access to the courts. Ohio Health Department is convinced to run a public education program regarding DES exposure. International meeting of DES groups held in Boston; the title of the meeting was “50 Years of DES, 1938-1988, Fifty Years Too Many.” DES activists from five countries (U.S., The Netherlands, Canada, France, Australia) provided updates on DES awareness in their countries.Grants from the San Francisco law firm, Hersh & Hersh, along with the Sumner T. McKnight Foundation made possible installation of a computer system in the DES Action office, as well as the sponsoring of a research conference in Minneapolis. DES Action sponsored an international consumer gathering, the “DES Research Symposium: Looking Back, Looking Forward,” in Minneapolis. DES Action develops medical and nursing school curriculum for national distribution. After years of grassroots organizing led by DES Action, Congress finally passed the DES Education and Research Amendments. House Resolution 4178 mandated a national program of research, outreach and education about DES. Federal funding was provided to the National Cancer Institute (NCI) for a combined long-term cohort research project, the DES Follow-up Study. The previously started DES-Adenosis Project was incorporated into this larger research effort. National Cancer Institute (NCI) announced grants for a program of DES education for the public and health care providers. National Cancer Institute established a committee to study non-cancer effects resulting from DES exposure; consumer education booklets were published by NCI. DES Action takes the steam out of an awards banquet funded by Eli Lilly and hosted by the “Society for the Advancement of Women’s Health Research,” a sham front for Big Pharma. The protests resulted in Senator Olympia Snow and Representatives Pat Shroeder and Henry Waxman to publicly decline the honors they were slated to receive that night. This is one of many letters sent to help convince Waxman and the others. Here is what SCRIP wrote on June 21, 1996 about DES Action’s advocacy in preventing the hypocrisy of Lilly presenting women’s health awards while having been the major producer of a drug that harmed women. Congress passed legislation authorizing renewed funding to continue DES research (including the NCI DES Follow-up Study) and education. PBS-TV airs cancer daughter Judith Helfand’s documentary A Healthy Baby Girl, to show the personal experience of dealing with DES-linked cancer. The video telling of the DES story spread awareness across the country. DES research conference, “DES:Future Directions Research Update, 1999,” held in Washington, DC, and sponsored by the National Institutes of Health (National Cancer Institute, National Institute of Environmental Health Sciences and the Office of Women’s Health), and the Centers for Disease Control and Prevention. The FDA acted to withdraw approval of diethylstilbestrol so it could no longer be prescribed for human use.International Colloquium held in Washington DC to recognize 30-years of DES Discovery, Education and Science (1971-2001).Moving photo essay published by cancer daughter Margaret Lee Braun, DES Stories: Faces and Voices of People Exposed to Diethylstilbestrol – put a human face on the DES tragedy.DES Action joined the National Institute of Environmental Health Sciences (NIEHS) consumer advocacy committee, Partners. DES Action participates monthly in discussions about environmental and health research with NIEHS staff members and representatives from other organizations. International Colloquium held in Washington DC to recognize 30-years of DES Discovery, Education and Science (1971-2001). Moving photo essay published by cancer daughter Margaret Lee Braun, DES Stories: Faces and Voices of People Exposed to Diethylstilbestrol – puts a human face on the DES tragedy. DES Action joined the National Institute of Environmental Health Sciences (NIEHS) consumer advocacy committee, Partners. DES Action participates monthly in discussions about environmental and health research with NIEHS staff members and representatives from other organizations. Centers for Disease Control and Prevention (CDC) DES Update launched a national education effort with a website and publications to educate DES-exposed individuals and their health care providers. DES Action USA established Online Support Group for DES Daughters to communicate via email. The important finding that DES Daughters over age 40 are nearly two times more likely than unexposed women to develop breast cancer was published in the journal, Cancer Epidemiology, August 2006. The story of DES grassroots advocacy was published in Pat Cody’s book, DES Voices: From Anger to Action. DES Action celebrated 30 years of action. A focus has been kept on DES exposure with the organization’s mission to identify, educate, empower and advocate for DES-exposed individuals. The U.S. Supreme Court upheld the right of individuals to sue drug companies and recover damages. DES Action USA filed an Amicus Brief in Wyeth v. Levine claiming individuals should be able to file lawsuits, especially if the FDA failed to rigorously evaluate a drug’s safety – as with DES. With Congressional funding approved, the National Cancer Institute renewed its commitment to DES research for an additional five years. The FDA, in a 2/22/2011 letter to then Senator John Kerry, conceded the DES experience is a tragedy but refused to apologize for it.In recognition of the 40th anniversary of the association being made between prenatal DES exposure and adult onset disease a thoughtful Perspective piece on the DES experience was published in the April 20, 2011 New England Journal of Medicine (NEJM). DES Action called the article a valuable historical review with acknowledgment that further DES research must continue.Later that year the October 6, 2011 issue of the NEJM ran a important article by National Cancer Institute researcher Robert Hoover M.D., Sc.D., listing twelve adverse health impacts now conclusively linked to prenatal exposure for DES Daughters. It was read by doctors around the country and garnered much national media coverage regarding DES exposure, such as this Associated Press story about the research published in USA Today. In a precedent setting decision on Jan. 19, Federal Judge Marianne Bowler, in Boston, ordered 14 drug companies to negotiate settlements with 53 DES Daughters who brought suit claiming their breast cancers were caused by prenatal DES exposure. Mediation talks in April were unsuccessful between the DES Daughter plaintiffs and drug makers so the Judge scheduled January, 2013 for this product liability case to go to trial. DES Action USA undertook its second Health History Survey with a grant from the Robotti Foundation. A surprise offer by Eli Lilly settled a major DES Breast Cancer case (1/9/13) on day two of trial (Fecho v. Eli Lilly). That meant the drug maker did not have to admit fault. Negotiated settlements were hammered out for the remaining DES breast cancer plaintiffs, which ended hopes for the case being heard by a jury. The DES Health History Survey again found a higher incidence of asthma and Lupus among DES Daughters and DES Sons than is reported in unexposed women and men of the same ages. These self-reported adverse health findings were shared with the research community. NCI DES Follow-up Study researchers began looking for a possible DES biomarker to find out if a blood test can confirm prenatal DES exposure.DES Action USA urges the FDA to be cautious when considering drugs to treat female sexual dysfunction. There’s a push by some groups for approval of a female version of Viagra, a so-called “Pink Viagra.” But in our letter we warn the FDA against trying to “fix” women’s bodies via drugs – especially drugs whose safety and effectiveness have yet to be proved. Congressional Representative Louise Slaughter is a longtime advocate for women’s health issues and a leader in support of funding for DES research. However, she wrote to the FDA urging approval of a female sexual dysfunction drug because there are several for men. So DES Action has asked Slaughter to reconsider, telling her this isn’t a gender issue. We raised concerns of a future tragedy should the FDA approve a drug for women that isn’t much better than a placebo and whose safety remains in question. D.E.S. Reseau, the DES consumer organization in France, released results of its survey of DES-exposed individuals. Out of it comes interesting news. No increased risk of reproductive organ abnormalities in DES Granddaughters however an increase in reported hypospadius in Grandsons and also esophageal atresia (obstruction) was identified in both DES Granddaughters and Grandsons. For DES Daughters this French survey found positive news – the breast cancer risk does not appear to increase with age, despite hints of that in an earlier U.S. study.